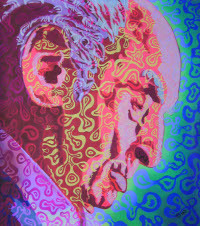 Last week I paid tribute to Albert Hoffman at an event hosted by Reality Sandwich. I have been following the site for a while, and really enjoyed the screenings and the conversation (led by John Perry Barlow and Daniel Pinchbeck). I was a bit startled to encounter a perspective that I hadn’t thought about for a while. There were psychedelic enthusiasts who faithfully imagined the world being a better place if we all took a little trip (slight caricature, but bear with me). After a few years working on the Icarus Project and immersed in academia I found this attitude slightly jarring. Talk about technological determinism – our salvation in the form of an external molecule? I happen to think that a bit of psychedelic experimentation might certainly help make the world a better place, but for one thing, if society were truly tolerant of freaks and drugs, we wouldn’t need them so badly in first place. For another, psychedelics are arguably more available now than ever before, and they haven’t (yet) catalysed the transformation imagined. But what really bugged me is how this counter-cultural rhetoric would play directly into the hands of Big Pharma. Their message for years is that happiness can be found at the bottom of a pill bottle. Try to vividly imagine what these drugs would look like in their hands – the clinical administration of extracted active ingredients, outside of the usual cultural sacred context. This wouldn’t accelerate the evolution of consciousness, just the flow of capital into Pharma’s coffers. I also found it interesting to trace the genealogy of LSD back to psychiatry. To be completely fair, Reality Sandwich’s message isn’t so simple, but I do feel its important to imagine how these messages might be appropriated. Well, summer vacation is finally upon me – now I only need to work fulltime. My first year in my PhD program I found myself thinking alot about methods. Not all that surprising, given that one day I will have to defend my methods along with my ideas, but a pretty abstract space to be preoccupied with, nonetheless. where I basically finally cashed the promisary note I scribbled 2 years ago. While it was an effort to write, looking back I am glad this now exists, and I really do understand the argument much better than when I started writing it. This is reassuring, since I keenly aware of how difficult it is to capture people’s attention, and much of my writing will likely go unread. (I think this peice goes well w/ the Fall’s Out of Thin Air: Metaphor, Imagination, and Design in Communications Studies). Along the way I also created a little lesson plan around Nirvana’s Lithium & The Abilify Commercial for the Teach, Think, Play weekend workshop with David Buckingham. And, I presented the ZyprexaKills Campaign (slides, paper) in London at the Politics: Web 2.0 confernce.